Is a herbal formula which enhances liver function by assisting the liver to detoxify itself and the body. It also assists the bodyï¿½s own healing mechanism to heal damaged liver tissue. It is ideal for horses who have been exposed to toxins in the environment, or have had anaesthetics or a course of pharmaceutical drugs. You can see the improvement in the results of liver function tests which have previously shown raised liver enzymes. 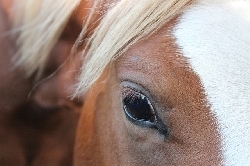 Generally the horse will regain more energy and vitality. The dose, mixed into dry feed, is 20mls daily or every second day and the course will last for 25 days of daily doses. In severe or long term cases, two courses may be recommended, although you will see results before the first course has finished. Dose: 20mls mixed into dry feed daily.